Tokyo missed out on hosting the 2016 Olympic Games after it was voted out in the second round of voting in during the 121st International Olympic Committee Session in Copenhagen today. Chicago was surprisingly voted out first and that left Madrid (Spain) and Rio De Janeiro (Brazil) left to duke it out for the vote. 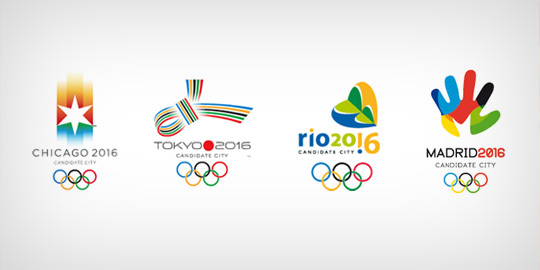 I have been keenly following the progress and various steps that each of the candidate city bids have gone through and made two posts the first one last year detailing my thoughts on Tokyo’s 2016 Olympic Bid and the second earlier this year when it showed that Tokyo’s bid to host the 2016 Olympic Games was strong. The second post got some really interesting comments from persons explaining why they thought some cities should or should not be the host which made for a very interesting read. 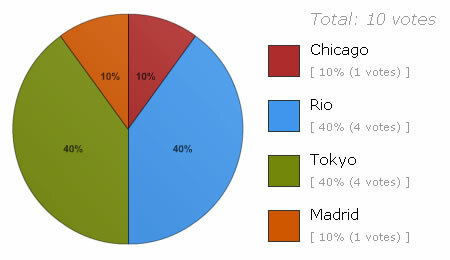 Minutes before the start of the voting by the IOC there was a lot of buzz and anticipation among some of my friends on twitter so I decided to throw out a quick twitter poll to see which city they wanted to host the 2016 Olympic Games. There was a obvious Tokyo bias as most of my pals are Japanophiles like me but interestingly Rio was right up there. and the winner is… Rio de Janeiro! The second largest city in Brazil famous for breath taking views, carnival, samba, and beautiful beaches will be hosting the 2016 Olympic Games. The first thing I though when they won was that at least I don’t have to be up in the middle of the night to watch the races Jamaica is involved in ^^. Congrats Rio! View details of their on Wikipedia or their official website at rio2016.org.br. To be honest, I wasn’t very happy about Tokyo’s candidature, so I’m kind of relieved it ended this way. Like most of the comments from your previous post, I also was concerned that for a city like Tokyo, the Olympics would have done more bad than good. I am kind of surprised Rio got the games. Are they ready for such an event? Well, I was hoping for Chicago. It would be a goose bumps moment to see Obama (wheather he’d be president or not) opening the games. Plus Americans are excellent when it comes to organizing big events. While I am happy for Rio and Brazil, I wonder, if they are up for the task to organize one of the biggest (if not the biggest) events in the world. I wish them best of luck. But I think Rio is better prepared than Chicago is.. Though it would have been nice if Chicago won (so I can go back to my hometown! ), but the city has too many problems to accommodate everyone. I’m glad Rio got it. Maybe it will push them to clean up the city (and modernize) like what happened with Beijing. There will be a lot of international scrutiny on them. I’m part of the pro-Rio gang though. From the video presentations I saw online Rio’s plans were unique, attractive and concrete. Kudos to them. Hope it turns out well. Tokyo’s bid fell short to me. Carnivale, samba, Copacabana, Ipanema and home of the Brazilian (the people and the wax)… can’t be all bad!